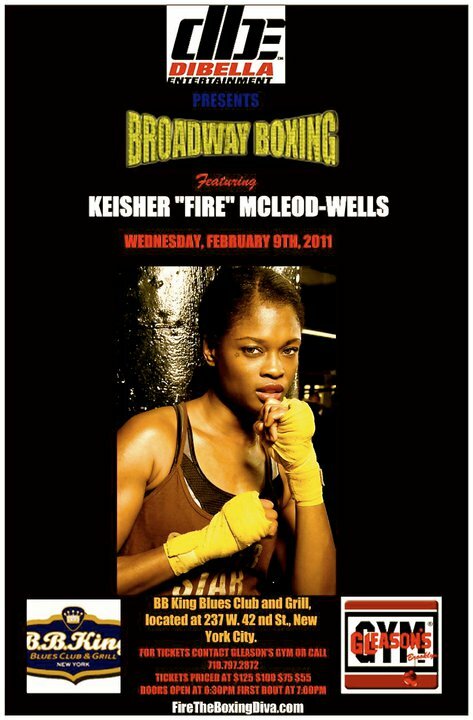 Gleason’s own four-time Golden Gloves winner Keisher “Fire” McLeod-Wells (3-1), will be fighting on February 9th, 2011 at B.B. King’s on a card promoted by DiBella Entertainment. This will be Keisher’s first six round bout where she will face off with San Francisco fighter Melissa “Mighty” McMorrow (4-1-3). For tickets and more information about this bout, contact Gleason’s Gym here. Rock Chicks Live has a piece about it here. WBAN has a piece about it here. And take a visit to Fire’s website here. I love coming over here and catching up on the bouts going down in the city. Fires me all up! Thanks, Lisa! I’m going to try and get a few minutes of video of Fire over the weekend to put on the site.